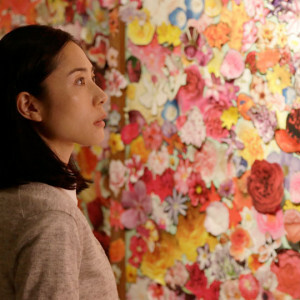 Jeremy Clarke on Kiyoshi Kurosawa’s supernatural love story Journey to the Shore. Mizuki is a widow. Yusuke drowned at sea three years ago. He seems very much alive although as he’s quick to explain he is, in fact, dead. This is a world where the dead are to be found among the living while they not only come to terms with their newly deceased status but also help those close to them to do the same before they leave this world forever. This strange juggling act is indicative of what is to come. Many of the characters in the film are living people, but a few are in the same position as Yusuke: dead and coming to terms with their newly acquired status. As the couple travel around and meet the various people Yusuke has known, it’s not immediately obvious which are the living and which are the dead. Director Kiyoshi Kurosawa’s Journey to the Shore is a quiet, subtle, underplayed affair which works on the level of a gentle romance. He adopts a basic road movie structure as the couple undergoes travels to the coast on the trains and buses of Japanese public transport to visit assorted characters who helped the husband in one way or another during his lifetime. The whole film carries a feeling of unreality about it as if we’re about to awaken from a peculiar dream. This is underscored by the recurring narrative device of Mizuki waking up at the start of a new day. The first time this occurs on the morning after her first meeting with Yusuke she goes into the kitchen where the bowl on the table suggests that the surreal events of last night may not have been a dream after all. Sure enough, Yusuke is still there. Unable to deal with his death and subsequent reappearance she begs him to stay forever. He counters by asking her to come with him on a journey. Thus a train trip takes them to the town where Yusuke worked as a general assistant on Mr Shimakage’s small newspaper delivery business. Yusuke encounters problems finding the latter until he chances to spot Mr Shimakage riding his motorbike. Mr Shimakage’s wife has long since left him. “Mr Shimakage is the same as me”, says Yûsuke, adding “…he hasn’t even noticed he’s dead.” The couple stay at Shimakage’s home for some days and Mizuki discovers his hobby of papering walls with flower pictures cut from magazines. One morning she awakens to find the premises gone to rack and ruin and their host vanished. He really was dead after all. They spend time with another couple who run a dumpling restaurant and of whom the woman, Fujie, is haunted by teenage memories of being unkind to her piano playing, younger sister Mako who died as a child. This emerges in a present day scenario where young Mako is tutored at the piano by Mizuki before Mako vanishes leaving the two sisters finally reconciled. On her own Mizuki visits Yusuke’s former dental nurse colleague Tomoko (Hana & Alice’s Yu Aoi) with whom she suspects him of having an affair. Tomoko unexpectedly turns out to be a very contented, happily married mother-to-be. Yusuke and Mizuki visit another town where legend has decreed a cave beyond a waterfall to be the pathway to the dead and Yusuke must help another dead man come to terms with his predicament. In the woods near the waterfall, Mizuki has a long chat with her deceased father. She also begins to reconcile with Yusuke. The whole tale proves a profoundly moving meditation on death, bereavement and loss. Actors portray dead people very much in the manner of living ones. There are no special effects or pallid make up. The dead here seem merely confused spirits who remain in our world for a while longer so they can put things right before they disappear. There’s something very affecting about all this. Both living and dead characters draw you in, helped no end by captivating performances which elicit our sympathy from cast members in parts both large and small. Some scenes such as Yusuke’s initial appearances also make very clever use of areas of dark and pools of light while a small number of later scenes deploy the gentle, atmospheric billowing of curtains in light wind to great effect. It’s at once a deeply ordinary, familiar world and one where the dead walk sometimes unwittingly among the living only to vanish forever when they come truly to terms with what they now are. It may be a slow paced piece, but it’s a singular vision well worth investigating. Journey To The Shore is out now on Dual Format BluRay/DVD from Eureka Video.